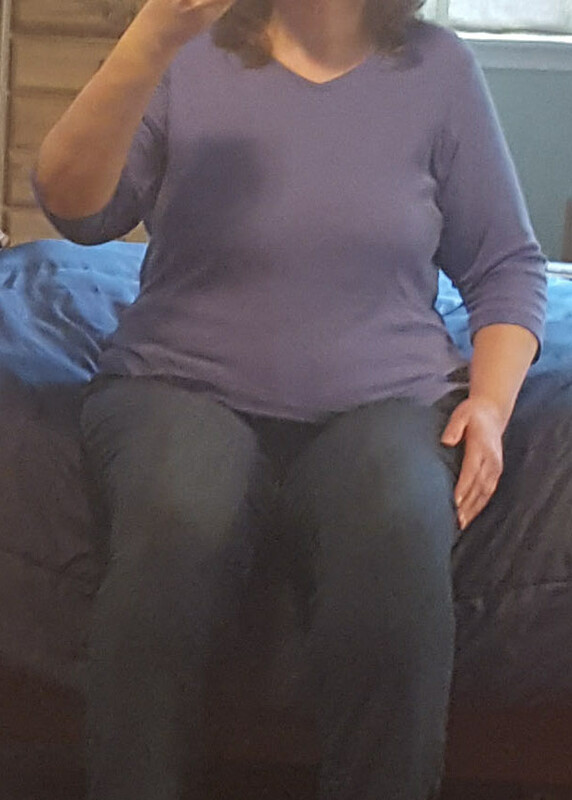 I was thinking the other day about progress pictures and how I used to look forward to taking them every ten pounds I lost. I kept that up for a really long time... even taking new pictures at weights I'd already done progress pictures for when I lost weight for a second, even third time (most famously for my 60 pounds gone (2008), 60 pounds gone again (2010), and 60 pounds gone AGAIN (2012) pictures. I was not about to do another set when I finally got back down to 218 again last month). My last post on Thursday included a link to pictures of me weighing 214 pounds. 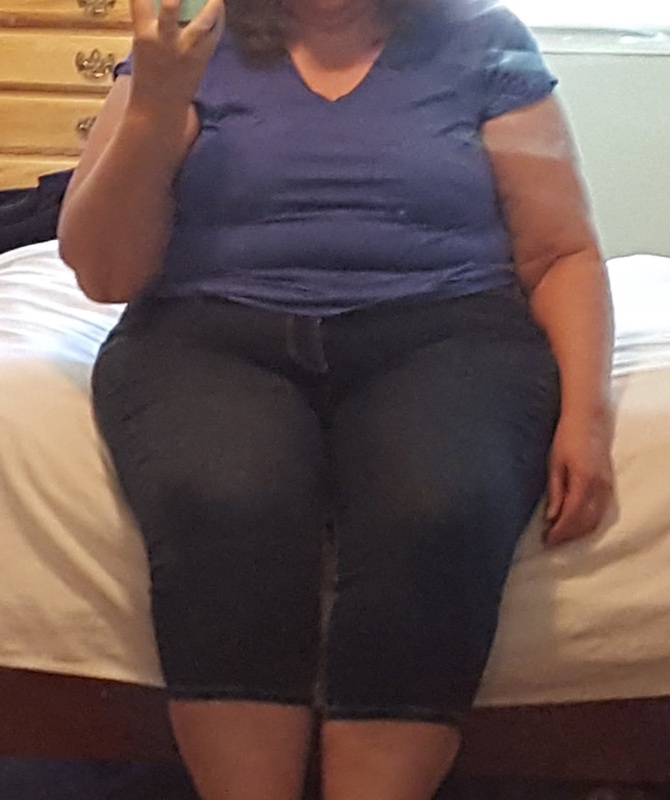 As I head back down the scale I notice I've lost the enthusiasm for posting progress pictures. You've seen it all before. But now, I am starting to get kind of excited about it again! I am pretty sure I only ever took "70 Pounds Gone" pictures once, the first time I hit that weight in 2010. So I think I will do some new pictures when I reach that weight. I'll take some measurements, too, because I haven't done that in ages! I think it will be interesting to compare the pictures and measurements to those at the same weight in the past. The other thing on my mind lately is formulating a weight loss and maintenance plan for after I stop taking phentermine. It helps me by suppressing my appetite; I am not hungry nearly as often and am satisfied with much smaller, less frequent portions. But I am not really sure what is going to happen when my doctor says it's time to stop the phentermine. I have one more refill left after this month, and I don't know if she is going to refill it again after that, or tell me that's enough. But at some point I'll be off it and if my appetite comes raging back, how am I going to handle that? How will I keep losing weight without it? I did it once before, but I was on Medifast. The whole thing makes me pretty nervous. I really LOVE how I feel being lighter and finally dropping weight after FIVE YEARS weighing more than I weigh now. I soooo don't want to go back, or stall, or get frustrated about dieting again. I don't want it to turn into a big emotional thing like it used to be. I want things to be like they are now... happy, content, calm, non-food-focused, and LOSING WEIGHT. And then I want maintenance to be... I dunno, not *easy*, but easiER than losing. And I don't think it will be. I have time to plan now, so I figure I better take the next six weeks and get my plan formulated in a way that makes sense and that I can stick to. Preparing/gathering data: Sometime soon I will go and have metabolic testing again. After I have lost all the weight I want to lose, I will wait a couple of weeks and then have it re-tested. I will use that knowledge immediately if the scale heads in the wrong direction, by counting calories and tracking. Important: I won't skip weighing. I have to weigh every day, plot it on a graph, and immediately adjust for any uptick. I know there will be holidays or times I *decide* to indulge, but I will still weigh and expect no more than a 3 pound gain that comes back off it no more than 3 days (like my Thanksgiving and Christmas week gains/relosses). Speaking of which, I almost forgot to add my weigh in today. I now weigh 212 pounds, a loss of 3 pounds this week. Eating: I generally look at any food and decide if I will have it based on whether I can have an enjoyable serving for about 15 grams of carbs or less. And I eat small portions, not too often. I'll keep doing that. But I know I will probably be more hungry, so I'll fill that "hunger gap" with produce: lots of low calorie vegetables and a couple servings of fruit every day. I really hope that is enough to make a solid eating plan that will keep me losing and then maintaining. If it's not, I will have to start counting calories again. Exercise: I think this is going to make all the difference in whether I can keep losing and then maintain or not. I am not formally exercising at all now, because I don't have much to burn while eating only 500-700 calories a day. But I am definitely more active than I was a couple months ago and will have to maintain the lifestyle activity. I also HAVE to exercise in a more scheduled, formal way. I will strength train and start biking again but honestly I think I have to find something different that I really love to do, for the long term. I mean I don't usually mind lifting weights or riding the stationary bike but there's really no joy in that activity itself... only in the results. I think I have GOT to find something that I love to do.... something active. I'm not sure what that's going to be. Maybe paddleboarding in the summertime, but I need year-round activity besides stuff like walking dogs, raking leaves, and pulling weeds. That's it for now. Here's to another good week! Congratulations on the ongoing weight loss. These are exciting times! 1. Figure out when weight loss end and maintenance begins. Do you have a target weight or target BMI or target anything else that tells you when to stop losing weight? You're at 212 right now and I don't know you're height so you could be 100 pounds from goal or 50 pounds from goal. You may have to consider making a plan before maintenance - how to lose while NOT on Phentermine. Talk to your doc about what happens to your body chemistry once you remove the drug from the equation. Learn what you can on your own about leptin and ghrelin and think back over all your weight loss experience and recall what worked for you to lose, in the past. Add that with information about where you're at now in life and be open to playing with food combinations to keep the losing going. 2. Read The Obesity Code by Jason Fung. Read The Diet Fix by Yoni Freedhoff and follow his blog. 3. Figure out why you eat / overeat. Right now your eating is below any normal recommended daily intake of calories, due to Phentermine. I'm not familiar with what led you to being overweight in the first place. If it was overeating at meals / when hungry, then you will definitely need a strategy to tackle the return of hunger. If you ate in relation to your emotions, then I'm not sure why you're doc would have even put you on Phentermine if increased appetite was never an issue, and you should then examine other ways to respond to your emotions. Given food hasn't been an issue at all for you while on Phentermine, maybe this is a moot point. 4. Figure out what successful maintainers do. Check with Sean Anderson at The Daily Diary of a Winning Loser and consider joining one of his support programs. At the very least, read his blog to learn what he does daily to maintain. Check out Karen P at gardengirlkp@blogspot.com. She is a stats queen and I love how she uses data to track and correct where she's at. Read Refuse to Regain by Barbara Berkeley. 5. It sounds like you've already given the fitness / movement thing some thought. Do what your body needs (strength training, stamina, mobility, flexibility) regardless of whether you like it or not. I don't enjoy doing laundry but I like clean clothes! Then find activities you absolutely love and can incorporate into your day. Those are about more than just calories (if you read The Obesity Code you'll figure out how irrelevant calories are and if you stay low carb / moderate fat, you're all good) and about loving what you get to do each day. I'm glad this working out for you. WOW Lyn those pictures truly show your loss and then some! Your current photo looks loads thinner than 200+ pounds. You must be so thrilled! I cannot wait to see where this goes for you. Thanks for the pics! Looking good. I have to respectfully disagree with your comment re: exercise, and hot having "much to burn" eating 500-700 calories - this is actually an ideal time for you to be making exercise a habit. You still have the fat reserves to ensure you have enough energy to handle some increased activity, provided you time your activity close to eating something. Even if you were to become a bit hungrier as a result, you have room to eat a bit more (and the activity will only add to that room) while still coming in well under recommended intake. This is really the time for you to maximize the use of every tool in the box, and waiting to start exercise doesn't make a lot of sense. You're not ill, and without any health problems preventing you from moving more, it would be one of the most beneficial things you could do to start establishing your post-phentermine success. It's OK to admit you don't love exercise, lots of us don't! Just be wary of giving yourself false excuses as to why you can't do something, as that can become a very slippery slope. Why not try intermittent fasting? In the past you have argued that it was not safe for you to fast, however you are practically fasting now with no problems. There are so many benefits to intermittent fasting, including fat burning and appetite suppression. On exercise, I have kept my 160 pounds of for 2 years now. Have I found an exercise I love, no, but I still make the choice daily to do my exercising. It is a must! I’m a person that really doesn’t love to exercise, I tried but I do know that I am also a person that will gain weight if I don’t. This is great news Lyn! You're doing amazing. I'm so very happy for you. I don't know about it being easier when you get to goal, I'm pretty sure you know it's not. Because if it was easy or easier, you and I would never have regained all that weight over and over. I actually think maintenance is harder than losing the weight. There's no reward of losing weight every week or of people complimenting you as you drop the pounds. It's still going to be a struggle. I've talked to Lifetime members in my Weight Watchers meeting, and they all say the same thing, it's hard to maintain their goal weight, really hard. Every day it's a struggle, and they have to be diligent. They all weigh and measure their food, almost all of them still track what they eat every day and get on the scale at least once a week, some of them weigh every day (that will be me - I always weigh every day now, and will for the rest of my life). Although they all say it's worth the effort. Please get in contact with a therapist right away and begin counseling to figure out why food was a problem in the first place. What wonderful progress!!!!!! Congrats!!!! Good job for formulating a plan of attack for when the medication ends!!! The truth about exercise: You don't have to love it. You just have to do it. Wonderful success! I'm thrilled for you that you have lost this weight, and think it is very smart to be thinking ahead to the issue of maintaining the loss. Most of us have found that to be the biggest challenge of all. A couple of things I have read or learned along my own journey are: 1)don't start any way of eating that you don't think you can keep up for the rest of your life, and 2)note what you are eating to lose weight and know that you will have to eat similar foods in possibly a little larger portions to maintain that weight loss. Even though you are eating very small amounts of food now, the choices you are making to limit carbs and eat only when hungry can form the basis for a lifetime program once you are to maintenance level. I sure wish you luck, and just know that losing weight and keeping it off is possible and you are well on your way! As far as when you come off Phentermine, I don’t think you need to be worried about your appetite coming raging back, because you’ve been eating such small amounts now for so long that your stomach has shrunk and you wouldn’t be able to eat a lot even if you wanted to. What will be most important is to remain vigilant on your portion sizes because if you’re anything like me, it won’t be binges that will do you in, it will be those extra quarter cups of servings that will turn into extra half cups of servings that will turn into extra cups of servings as your stomach stretches back out. It’s all the little “extras” that do me in once I start slacking on my diet, because over time those will stretch your stomach back out and lead to overeating, which will obviously lead to regain. Having said that, I really wish you the best of luck this time. I know from first-hand experience, and you do as well, that maintenance is far harder than the initial loss portion of weight loss, so “Ever Vigilant” should be your motto going forward. It’s a hard, hard task but oh so worth it. Take care, Lyn. Such great pictures to show the difference. Print them and smack them up in the bathroom and maybe kitchen to help keep your focus maybe when off the phen. I quit exercising due to an injury (from my sport) and gained 15 pounds. I'm slowly adding exercise back in but I can't go as frequently due to injury. Exercise is definitely the reason why I've been able to keep the weight off for so long so I highly recommend adding it in. Of course, I need to watch what I eat but I've been eating as much as I was while I was exercising so obviously, I gained weight. I spend an hour each day I go just commuting to the gym on top of an hour of exercise so I definitely wish I could cut that hour of commuting out! Good luck! You are such an inspiration to me. May I ask how tall you are? thanks! I am 5'6" tall.